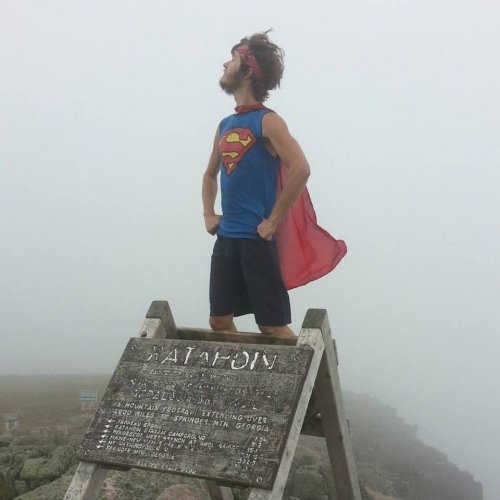 I have one last follow-up post about my 2015 Appalachian Trail thru-hike. A quick update on some of the characters I met along the way and what I did immediately after getting off the trail. 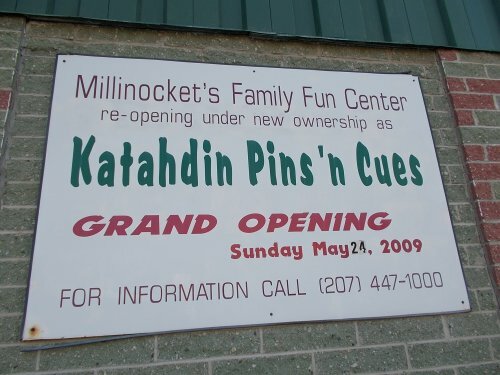 I spent a couple of days in Millinocket, the closest town to the end of the trail in Katahdin. The town seems like its a bit down on its luck, a shell of its former self, but I rather enjoyed the town. It was small and quaint. 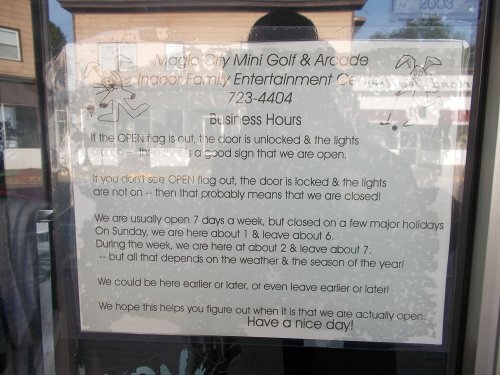 It had strange signs like the announcement of a grand opening of the Family Fun Center.... in 2009. I'm left wondering if it really reopened at all. Who knows?! 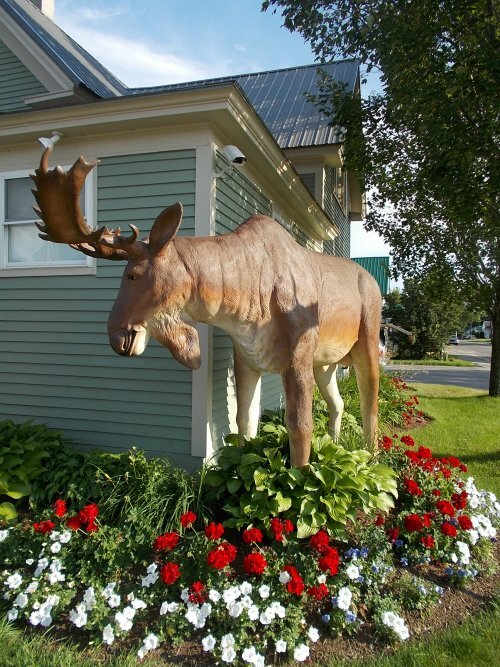 Watch out for moose in Millinocket! It was also fun spending a couple of extra days in Millinocket watching hikers I knew arrive and catching up with them one last time. I knew Bearfish had to be close behind me, and he was the one I was looking forward most to seeing again, and we did catch up in Millinocket. He had started his hike from Waynsboro, VA, and the last I talked to him, still hadn't decided if he was going to go back down and hike the rest of the trail. New Hampshire and Maine took a lot of the energy out of him. But in any case, he was definitely going to take an extended rest for a little while. Bionic Woman, the one-legged hiker I first met hiking up the Approach Trail on my first day--she did succeed in her thru-hike. She finished on December 30th, nearly 10 months after she finished. She certainly didn't set any speed records, but that was never the goal! Just completing the trail in a single year is an amazing accomplishment and last I heard about her, she had started writing a book about her trail adventures. I have no idea when that will be available but perhaps I'll post again when it is. The movie for A Walk In the Woods came out shortly after I finished the trail, and--of course--I had to go see it. It was okay, I suppose, but not nearly as funny as the book was. I didn't think it would translate into the big screen very well. It did so better than I expected, but at best... I considered it an okay movie. I'm very curious how much of an impact it has on the AT hiking community next year, though. I say that in jest, of course, although it is true. I finished the trail two days faster this time around than I did last time. What I find more interesting, however, is that I took 22 zero days this year--about a week more than I did my first time around. I needed more zero days to write these constant blog posts, check up on Atlas Quest and Walking 4 Fun (neither of which existed during my first thru-hike) and these things definitely slowed me down. 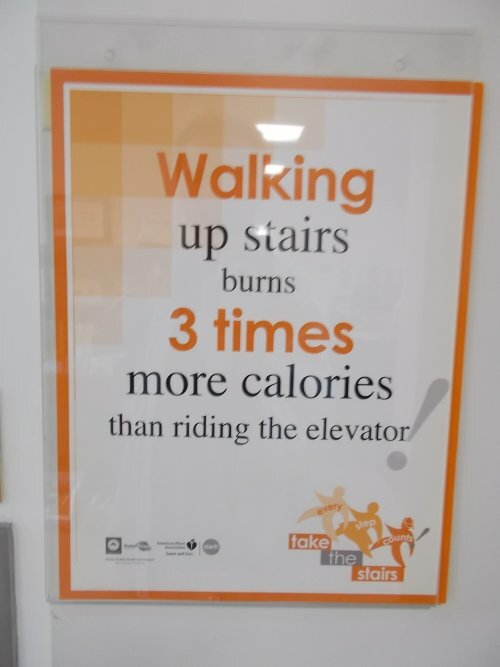 But I averaged more miles each day I did hike more than compensating for the difference--especially in the beginning. Also an interesting side note: My longest day of hiking this time around covered 23.7 miles. During my first thru-hike, it was slightly over 24 miles. So my longest day on the AT is still part of the 2003 thru-hike. I counted 21 official "rain days" in my logbook. A rain day was generally any day when it rained long enough and hard enough that I got wet. There were some days when a trace of rain would fall, but I didn't count those as rain days because I never really got soaked. The rain that fell dried faster than it fell! Other times it rained, but if I was safe and dry in a shelter or town and otherwise unaffected by the rain, it didn't count. So it rained a lot more than 21 times, but only 21 days did I have to actively hike in miserable rain. By comparison, during my 2003 thru-hike, I probably hiked that many days in rain in May alone. This trail this time around was a heck of a lot drier! I didn't get all of the photos processed and added to Walking 4 Fun until December, but you can now virtually walk the trail! 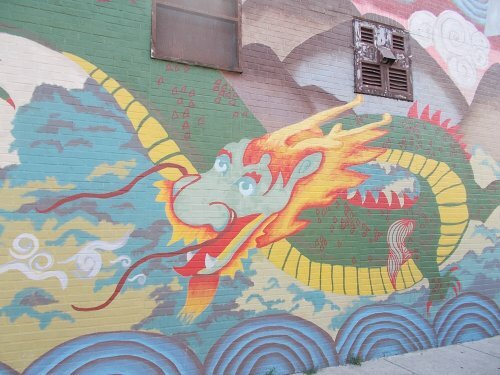 I wound up using 9,657 photos for the virtual walk, or about 4.4 photos per mile. 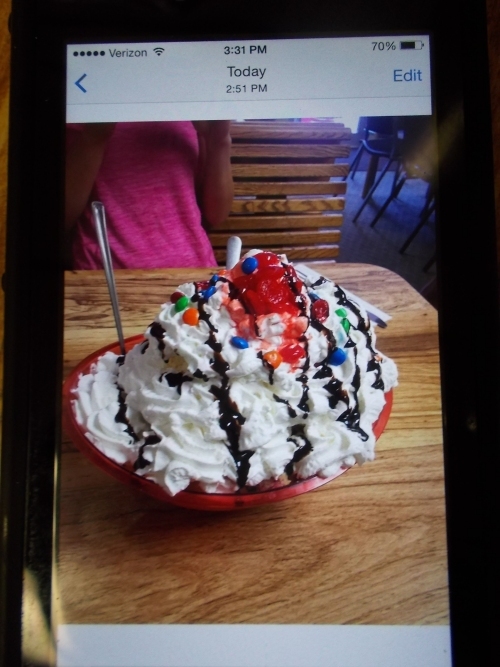 A lot more than you've seen on this blog! 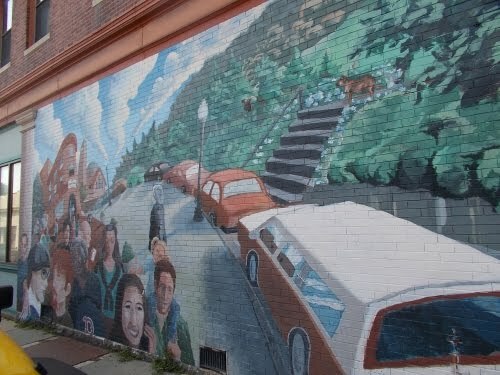 I left Millinocket a couple days after my arrival, getting a shuttle ride to Medford, Maine, where I caught a bus that took me to Bangor, where I caught another bus that took me into downtown Boston where I met up with my cousin and spent a week. I didn't loaf around for a week, though. No, I still had work to do. I spent the week pounding out blog posts to last at least through the end of September and getting some of my digital affairs in order because I wasn't quite done hiking yet. I was heading to Europe! 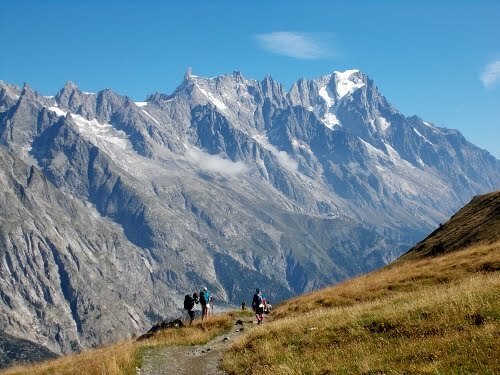 Hike the 110-or-so miles on the Tour Mont Blanc through France, Italy and Switzerland. It's a gorgeous trail around Mont Blanc, the highest peak in Europe. It would be my first time in both Italy and Switzerland as well. Then I'd take a bus to Milan, Italy. I wanted to check out the World's Fair. They call it an "Expo," but a World's Fair by any other name is still the World's Fair. =) I'd heard so much about them--in Chicago, in Paris and even in Seattle (the Space Needle was built for the World's Fair, after all), but I'd never been to a World's Fair and by golly, I'd been waiting for years to see one. If I was just a short jump away from it while hiking the Tour Mont Blanc, I may as well stop for this too. Then fly out to Corsica--a French island in the Mediterranean Sea off the coast of Italy. 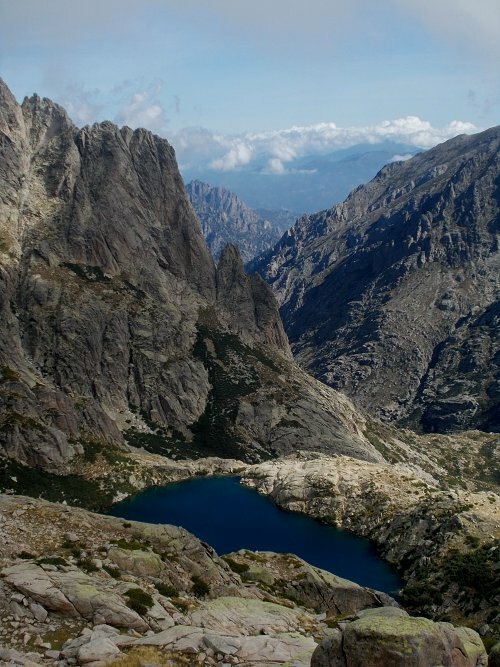 I intended to hike the 120-or-so miles of the GR 20, a difficult and strenuous trail crossing the spine of Corsica. I'll have company on this trail as well--Karolina, who hiked the West Highland Way with me last year--will be returning to my blog for a limited time! So I spent the week in Boston writing blog posts and organizing my whirlwind trip through Europe booking flights, buses and accommodations. The week would also give my banged-up knee a chance to rest and recuperate. 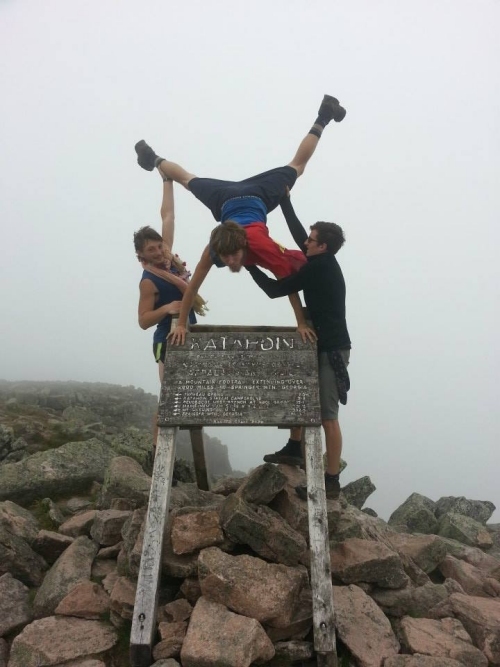 A less than impressive handstand at the top of Katahdin! That's Blueberry (L) and Heavyweight (R) holding up Superman. Don't think that Superman can't do a real handstand, though. 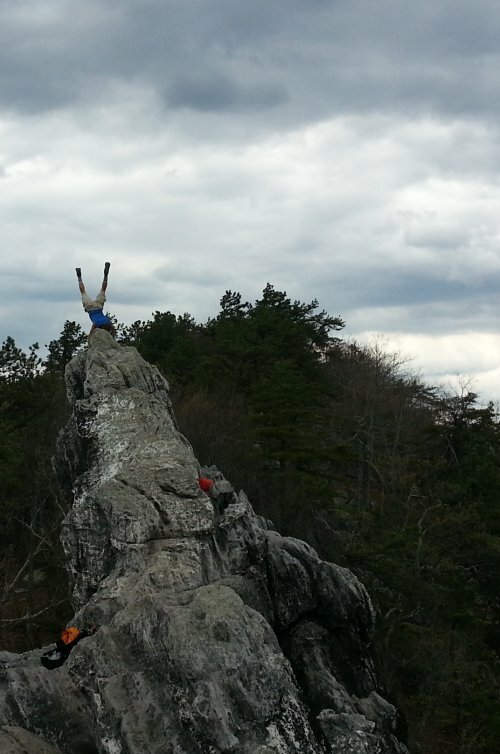 This is him doing one on Dragon's Tooth back in Virginia. INSANE! Not impressed with Dragon's Tooth? 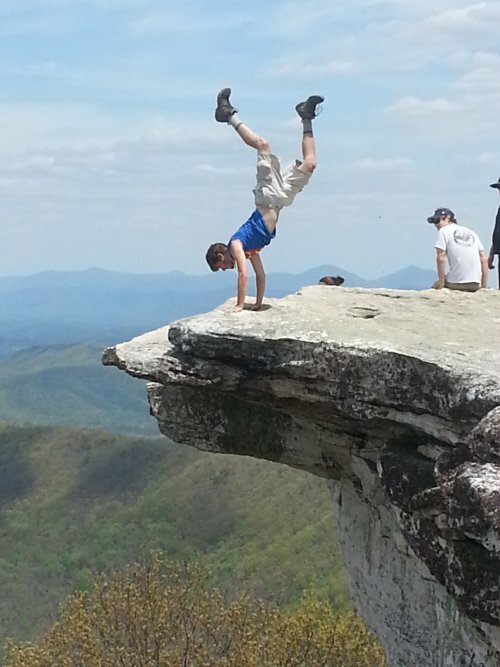 How about his handstand on McAfee Knob?! An exclusive sneak peak at the Tour Mont Blanc! Where the mountains are bigger than ever! 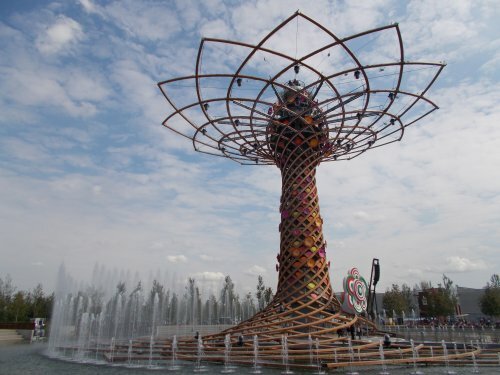 Then a quick jaunt to the World's Fair in Milan, Italy! And finally, my grand tour of Europe will end with a thru-hike of the GR 20--renowned around the world for being among one of the toughest trails out there. 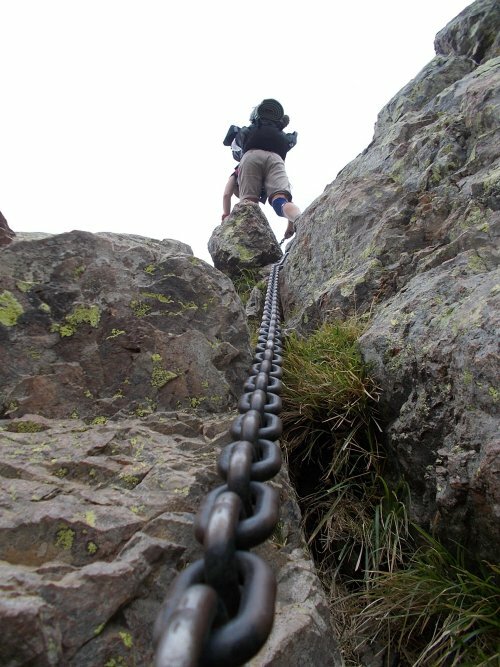 But the incredible scenery along the GR 20 makes it totally worth it! So stay tuned... there's a lot more coming to this blog! OMGosh! I'm so excited to hear about your Europe trip!